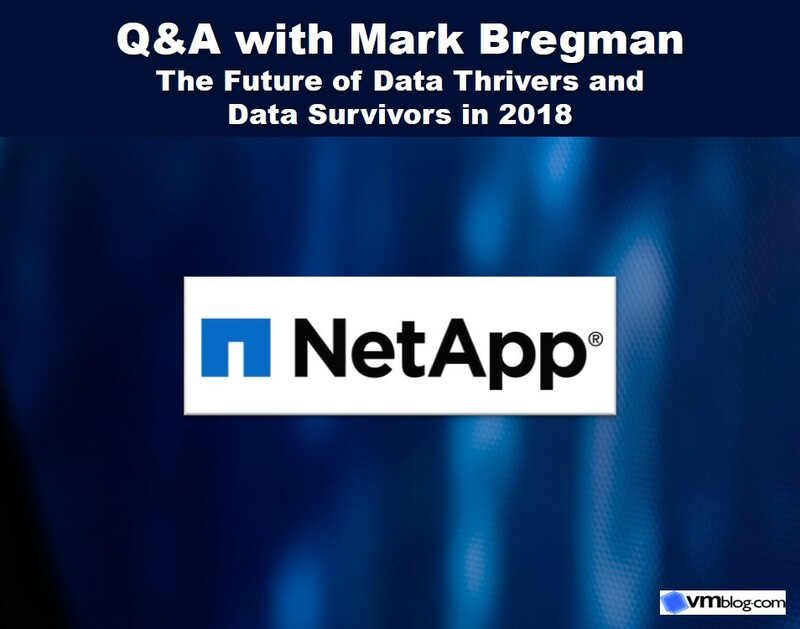 We talked with Mark Bregman, senior vice president and CTO at NetApp to discuss the differences between Data Thrivers and Data Survivors, and how the gap between these two will widen in 2018. VMblog: Can you explain the differences between Data Thrivers and Data Survivors? Mark Bregman: Data Thrivers are those organizations building their business around data and then deciding what business to be in. Thrivers are those visionaries who are aggressively disruptive in their use of digital technologies. On the flip side, Data Survivors are in a business, typically an existing legacy business, and they're just now trying to survive this data onslaught and figure out how to use it effectively. While Survivors know a digital transformation business strategy is necessary, their execution of it is still on a project basis. VMblog: Why will this gap continue to expand in 2018? Bregman: We've shifted fundamentally to a data driven world and if organizations don't act, they will move from survival mode to no longer existing as a business. According to a recent IDC survey, only 11 percent of companies surveyed fit the profile of a Data Thriver, which puts traditional organizations at risk of losing revenue to more data-driven ones. In the near future, we'll also see data become self-aware, and this is to the favor of Data Thrivers. The data will be self-describing and the metadata will make it possible for the data to transport, categorize, analyze and support itself. For organizations that run their business based on data, self-aware data will supercharge their existing strategy and make the whole business process easier. Finally, the explosion of data and the desire to do more with it in real time are driving more use cases for analytics and machine learning. Thrivers are more often at the cutting edge of these new styles because they're already pushing the envelope, while Survivors are just trying to stay afloat in the Big Data sea. VMblog: What are the best practices for organizations looking to pivot their data strategy and move from a Data Survivor to Data Thriver in 2018? Bregman: Both Thrivers and Survivors are dealing with the same explosion of data and demands of digital transformation. But, I think one of the main challenges is that Data Survivors are in survival mode. There's a shift that needs to take place in thinking and the first part of this is really the desire to transform the organization. For these organizations, it's critical to get a clear understanding of the role data plays in their current business. Many businesses don't understand this well, and it's not a matter of just knowing you have an accounting system, an inventory management system and an HR system. After making this shift in thinking, the first step is to really think at a higher level about how your data fits in your business. Once there is an understanding of the type of data you have, the value of that data and how it's used, you can start to imagine new sources of data that can contribute to new business insights. Ultimately, moving from Survivor to Thriver requires a leap of faith. Recognizing the problem is the starting point.